[FREE IRAN Project] In The Spirit Of Cyrus The Great :: View topic - What�s The Most Effective Strategy For FREE Iran ? What�s The Most Effective Strategy For FREE Iran ? 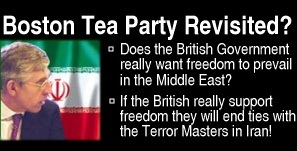 Posted: Wed Feb 15, 2006 9:56 pm Post subject: What�s The Most Effective Strategy For FREE Iran ? How Can We SAVE and FREE IRAN? What is The Best FREE IRAN Strategy? Can We Open Prison Door From Inside Prison When Islamofascist Militia (Basij) Are In Control? 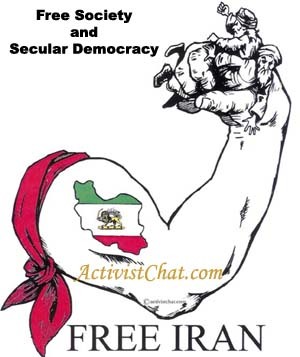 What�s the most Effective Strategy of releasing 70 million Iranian People as the hostages of Islamist Clerical regime , Islamofascist Militia (Basij) and Islamofascist security forces (Elements of Pasdaran and others) and replace the regime with Free Society and Secular Democracy ? 1. Support Iranian people for general strike. 2. Support Iranian dissidents as possible elements of change. 3. Zero tolerance to human rights violations in Iran and demand release of all political prisoners NOW. 4. To stop, with immediate effect, all international trades with the undemocratic Islamic �Republic� of Iran. 5. To stop the purchase of oil from Iran and not to start any new contracts or renew any existing ones. 6. Provide all necessary financial and military support for the freedom-loving Iranian opposition both inside and outside Iran to remove the regime in a short period of time. 7. Training for 200,000 Iranian youth to replace the Islamofascist elements of security forces when the regime collapse. 9. Islamist Regime must be kicked out of UN. 10. Launch US surgical military strikes against Islamofascist elements of regime. 11. Help Iranian Security Forces Uprising. This is for your review and comments. 1- Ahmadinejad plotted many dissident's murder and was directly involved in the 1989 assassination of Iranian exile Kurdish opposition leader Abdul Rahman Ghassemlou and two other Kurdish politicians in Vienna, Austria. A murderer and Terrorist is not a representative of freedom-loving Iranian Nation. 2- According to Ahmadinejad himself, he has executed at least 1000 freedom-loving Iranian people in the prison and he was known as �Tir Khalas Zan�, literally meaning �he who fires coup de grace�. Many female former political prisoners raped by Ahmadinejad. Such a dirty person and virus is not president of Iran. 3- Ahmadinejad is responsible for �Lovers of Martyrdom Garrison� in Iran that would recruit individuals willing to carry out suicide operations against Western targets. Do not allow this Terrorist to put his foot on US soil and enter UN. 4- Ahmadinejad played a central role in the seizure of the United States embassy in Tehran in November 1979 and he was key American hostage-taker for the 444-day. 41. Destruction of Iran’s agriculture. (New York, December 15, 2005) ? Iran?s new Minister of Interior is implicated in grave human rights violations over the past two decades, possibly including crimes against humanity in connection with the massacre of thousands of political prisoners, Human Rights Watch said in a briefing paper released today. It?s completely unacceptable that men with such records would be serving in Iran?s government. They should be removed from their posts and investigated for these terrible crimes. Human Rights Watch also said that the new Minister of Information should be investigated for his possible involvement in a dissident?s killing. The briefing paper, Ministers of Murder: Iran?s New Security Cabinet, details credible allegations that Minister of Interior Mustafa Pour-Mohammadi and Minister of Information Gholamhussein Mohseni Ezhei were involved in extremely serious and systematic human rights violations over the past two decades. ?It?s completely unacceptable that men with such records would be serving in Iran?s government,? said Joe Stork deputy Middle East director at Human Rights Watch. ?They should be removed from their posts and investigated for these terrible crimes.? Iran?s cabinet is now dominated by former security and intelligence officials, Human Rights Watch said, raising fears that President Ahmadinejad?s government will readily resort to violence to suppress dissidents and punish critics. During Pour-Mohammadi?s tenure as top deputy of the Ministry of Information from 1987 to 1999, agents of the ministry systematically engaged in extrajudicial killings of opposition figures, political activists, and intellectuals. In 1988, the Iranian government executed thousands of political prisoners held inside Iranian jails. The deliberate and systematic manner in which these extrajudicial executions took place may constitute a crime against humanity under international law, Human Rights Watch said. Mustafa Pour-Mohammadi was a member of the three-person committee that ordered prisoners held in Tehran?s notorious Evin prison to their summary executions. From 1990 to 1999, Pour-Mohammadi was director of foreign intelligence operations in the Ministry of Information. During this period, dozens of opposition figures were assassinated abroad. In some of these cases the hand of the Iranian government has been well established, while in others there are credible allegations of government involvement. Pour-Mohammadi is at the center of strong allegations of direct involvement in orchestrating these assassinations. In 1998, agents of the Ministry of Information killed five prominent activist intellectuals in Tehran. An Iranian source with first-hand knowledge of the investigation told Human Rights Watch that Pour-Mohammadi was implicated by investigators in those killings and even that an arrest warrant was about to be issued for him. ?But instead it was arranged that he leave his post in the Ministry of Information,? this source said. Gholamhussein Mohseni Ezhei, the new Minister of Information, served as prosecutor general of the Special Court for the Clergy and in this position spearheaded the prosecution of prominent reformist clerics. He has also been a key figure in suppressing press freedoms, resulting in the closure of more than 100 newspapers since 2000. Several journalists and activists have alleged that Mohseni Ezhei ordered the kidnap and killing of Pirouz Davani, a dissident and political activist, in 1998. Human Rights Watch called on President Ahmadinejad to relieve Pour-Mohammadi and Mohseni Ezhei of their duties immediately and to establish an independent mechanism to conduct a thorough and impartial investigation into their alleged crimes. If President Ahmadinejad fails to remove Pour-Mohammadi and Mohseni Ezhei from his cabinet, the Parliament should call for a vote of no-confidence and initiate its own independent investigation, Human Rights Watch said. ?It?s downright dangerous to have men like this in charge of key ministries,? said Stork. ?The international community must make clear that it holds the government of President Ahmadinejad responsible for the safety of Iranian political activists and dissidents.? Freedom-loving Iranian people don't trust the Greedy EU-3 Neo Coloniali$t$ who had the lucrative trade deals With the Mullah$!. The British Defence Secretary John Reid as part of Nato must hands off . 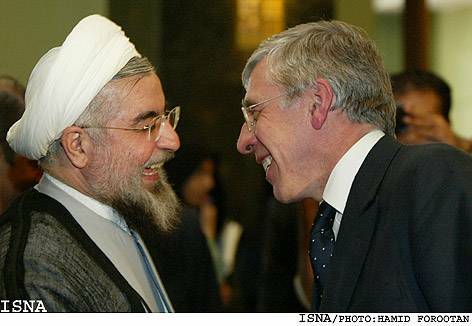 Due to 300 years of British bad deeds in Iran, the freedom loving Iranian people can not trust anything which involves Britain or EU3. US strategist must be careful and open their eyes to historical facts, US must distance itself from EU-3 Neo Coloniali$t$ and American forces must remain symbol of liberity and not associate themselves with EU3 . Today US enjoys the trust of 70 to 80% of Iranian people, this is the highest rating in the world naturally the EU3. Russia and China are not happy from this US popularity among Iranian people and they love to drag US in the 300 years old dirty mud of the Neo Coloniali$t$ . The Israel and Iranian Jews also enjoy highest rate of popularity among Iranian people in Iran despite all the propaganda against them by Mullahs therefore they must follow a wise strategy and don�t fall in EU 3 Neo Coloniali$t$ trap. The EU3, Russia and China love to create another mess for both Israel and US. The key decision makers and strategist must be wise. جک استرا، وزير خارجه بريتانيا، تاييد کرده است که کشورش با ايالات متحده آمريکا بر سر ايران اختلاف نظر دارد. آقای استرا به کميته روابط خارجی پارلمان بريتانيا گفت بريتانيا خواهان تغيير رژيم (در ايران) نيست. او گفت مقامات لندن بسختی در تلاش هستند تا به آنچه که وی مذاکرات و تماسهای سازنده با ايران ناميد، ادامه دهند. اين درحالی است که آمريکا، ايران را بخشی از "محور شرارت" می داند. مقامات آمريکا ايران را متهم به تلاش برای دست يابی به سلاحهای هسته ای می کنند. Blair and Jack are counterpart of Mullah�s deception. No serious person can believe that the negotiations are going to block, or even seriously delay, the Iranian race to acquire atomic bombs. 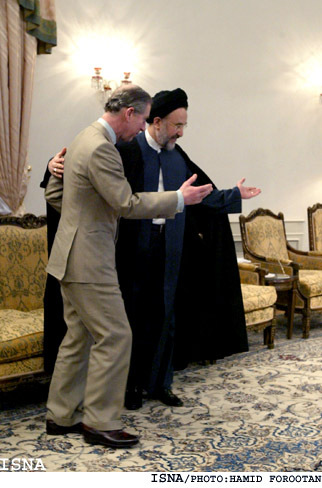 The European posturing is the Western counterpart of the Iranian deception, a ritual dance designed to put a flimsy veil over the nakedness of the real activities. The old-fashioned name for this sort of thing is "appeasement," and was best described by Churchill, referring to Chamberlain's infamous acceptance of Hitler's conditions at Munich. Chamberlain had to choose between war and dishonor, opted for the latter, and got the former as well. That is now the likely fate of Blair, Chirac, and Schroeder. The British under Blair's government Deported Dying Iranian Asylum Applicants for Execution to their Mullah Buddies Yet Again! This picture says a thousand words!!!! 1)	In past 26 years EU3 and Japan enjoyed buying cheap oil and adding over 4 dollars taxes to each gallon for covering EU3 government expenses while American people are paying for Persian Gulf Oil protection by US forces, in reality US is subsidizing OIL for EU3 and Japan to destroy American Jobs and economy. American work force and American blood created EU3 welfare. No wonder why the quality of life is decreasing in US while the quality of life is increasing in EU3 despite the fact that the American people are working harder with less vacation. 2)	Iranian people lost so much that the list is so big that you can read it in many articles in this site. 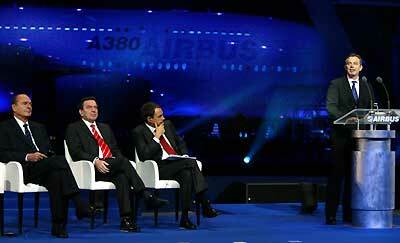 By now we know where the money for the Airbus A380 project has come from? The Airbus A380 "superjumbo" is the largest civil aircraft ever built. Designed to carry 555 passengers in a three-class arrangement, it has one-third more seating capacity than a Boeing 747. A planned stretched version would carry 656 passengers, and an all-economy-class configuration would be able to carry more than 800 passengers. It is easy to damn the 1930s appeasers of Hitler, given what the Nazis ultimately did when unleashed. But history demands not merely recognizing the truth post facto, but also trying to reconstruct the rationale of something that now in hindsight seems inexplicable. Appeasement in the 1930s was popular with the European public for a variety of reasons. All of them are instructive in our hesitation about stopping a nuclear Iran, or about defending the right of Western newspapers to print what they wish--or about fighting radical Islamism in general. British intellectuals, like European Union idealists today, wrote books and treatises on the obsolescence of war. Winston Churchill was a voice in the wilderness--and demonized as a warmonger and worse. The 50-year Cold War is over and Europe is at last free of burdensome military expenditure and the threat of global annihilation. Like Osama bin Laden, Iranian President Mahmoud Ahmadinejad senses a certain weariness in much of the West as it counts on perpetual peace. He assumes that most sober Westerners will do almost anything to avoid military confrontation to stop a potential threat--even though, unlike Hitler, Ahmadinejad not only promises to liquidate the Jews but reveals his method in advance by seeking nuclear weapons. Some naive conservatives in prewar Europe thought the German and Italian fascists would prove a valuable bulwark against communism, and so could be politically finessed. So, too, it has been at times with Islamic fascism. Arming the mujahedeen in Afghanistan, Pakistan or Saudi Arabia was once seen as an inspired way of thwarting Soviet communist imperialism. At the time of the Ayatollah Khomeini's homicidal fatwa against Salman Rushdie, religious conservative commentators from Patrick Buchanan to New York's Cardinal John O'Connor attacked Rushdie, rather than defend the Western right of free expression. In the 1930s, the doctrine of appeasement fobbed off responsibility for confronting fascism onto the League of Nations. France and England were quiet about the 1936 Italian invasion of Ethiopia and the German militarization of the Rhineland. They counted on multilateral action of the League, which issued plenty of edicts but marshaled few troops. Likewise, the moral high ground today supposedly was to refer both the Iraqi and Iranian problems to the UN. But considering the oil-for-food scandals and Saddam Hussein's constant violations of UN resolutions, it is unlikely that the Iranian theocracy has much fear that the UN Security Council will thwart its uranium enrichment. As fascism spread, France worked on fortifying its German border with the Maginot Line, Oxford undergraduates voted to refuse "in any circumstances to fight for king and country," and British newspapers decried the Treaty of Versailles for unduly punishing Germany. This was all long before the "no blood for oil" slogan and Al Gore in Saudi Arabia apologizing for the supposed American maltreatment of Arabs. But deja vu pertains not just to us but our enemies as well. Like the Nazi romance of an exalted ancient Volk, the Islamists hearken back to a mythical purity, free of decadence brought on by Western liberalism. Similarly, they feed off victimization--not just recent defeats, but centuries-old bitterness at the rise of the West. Their version of the stab-in-the-back Versailles Treaty is always the creation of Israel. Just as Hitler concocted incidents such as the burning of the Reichstag to create outrage, Islamist leaders incite frenzy in their followers over a supposed flushed Koran at Guantanamo and inflammatory cartoons. Anti-Semitism, of course, is the mother's milk of fascism. It is always, they say, a small group of Jews--whether shadowy Cabinet advisers and international bankers of the 1930s or the manipulative neoconservatives and Israeli leadership of the present--who alone stir up the trouble. The point of the comparison is not to suggest that history simply repeats itself, but to learn why intelligent people delude themselves into embracing naive policies. After the removal of the Taliban and Hussein, the furious reply of the radical Islamist world was to censor Western newspapers, along with Iran's accelerated efforts to get the bomb. In response, either the West will continue to stand up now to these reoccurring post-Sept. 11, 2001, threats, or it will see the bullies' demands only increase as its own resistance weakens. Like the appeasement of the 1930s, opting for the easier choice will only guarantee a more costly one later on. Victor Davis Hanson is a Senior Fellow at the Hoover Institution, Stanford University , a Professor Emeritus at California University , Fresno , and a nationally syndicated columnist for Tribune Media Services. He was a full-time farmer before joining California State University , Fresno , in 1984 to initiate a classics program. In 1991, he was awarded an American Philological Association Excellence in Teaching Award, which is given yearly to the country's top undergraduate teachers of Greek and Latin. Hanson was a National Endowment for the Humanities fellow at the Center for Advanced Studies in the Behavioral Sciences, Stanford, California (1992-93), a visiting professor of classics at Stanford University (1991-92), a recipient of the Eric Breindel Award for opinion journalism (2002), and an Alexander Onassis Fellow (2001) and was named alumnus of the year of the University of California, Santa Cruz (2002). He was also the visiting Shifrin Chair of Military History at the U.S. Naval Academy, Annapolis , Maryland (2002-3). Hanson is the author of hundreds of articles, book reviews, scholarly papers, and newspaper editorials on matters ranging from Greek, agrarian and military history to foreign affairs, domestic politics, and contemporary culture. He has written or edited 16 books, including Warfare and Agriculture in Classical Greece (1983; paperback ed. University of California Press, 1998); The Western Way of War (Alfred Knopf, 1989; 2d paperback ed. University of California Press, 2000); Hoplites: The Ancient Greek Battle Experience (Routledge, 1991; paperback ed. 1992); The Other Greeks: The Family Farm and the Agrarian Roots of Western Civilization (Free Press, 1995; 2d paperback ed. University of California Press, 2000); Fields without Dreams: Defending the Agrarian Idea (Free Press, 1996; paperback ed. Touchstone, 1997); The Land Was Everything: Letters from an American Farmer (Free Press, 2000); The Wars of the Ancient Greeks (Cassell, 1999; paperback ed., 2001); The Soul of Battle (Free Press, 1999, paperback ed. Anchor/ Vintage, 2000); Carnage and Culture (Doubleday, 2001; Anchor/Vintage, 2002); An Autumn of War (Anchor/Vintage, 2002); Mexifornia: A State of Becoming (Encounter, 2003), Ripples of Battle (Doubleday 2003), and Between War and Peace (Random House 2004). His newest book, A War Like No Other: How the Athenians and Spartans Fought the Peloponnesian War (Random House), was published in October 2005. Click here to read more about the book. Hanson coauthored, with John Heath, Who Killed Homer? The Demise of Classical Education and the Recovery of Greek Wisdom (Free Press, 1998; paperback ed. Encounter Press, 2000) and, with Bruce Thornton and John Heath, Bonfire of the Humanities (ISI Books, 2001). Hanson has written for the New York Times, the Wall Street Journal, the Los Angeles Times, International Herald Tribune, the New York Post, the Claremont Review of Books, The New Republic, National Review, American Heritage, Policy Review, Commentary, Wilson Quarterly, Weekly Standard, Daily Telegraph, and Washington Times and has been interviewed often on National Public Radio, the PBS Newshour, the Hugh Hewitt Show, and C-Span's BookTV. He serves on the editorial board of Arion, the Military History Quarterly, and City Journal. In 2004, Hanson began a syndicated column for Tribune Media Services which appears in newspapers nationwide, and since 2001, he has written a weekly column for National Review Online. Hanson was educated at the University of California , Santa Cruz (B.A. Classics, 1975), the American School of Classical Studies (1978-79) and received his Ph.D. in Classics from Stanford University in 1980. He lives and works with his family on their forty-acre tree and vine farm near Selma, California, where he was born in 1953. SHANGHAI, Feb. 17 -- China is hastening to complete a deal worth as much as $100 billion that would allow a Chinese state-owned energy firm to take a leading role in developing a vast oil field in Iran, complicating the Bush administration's efforts to isolate the Middle Eastern nation and roll back its nuclear development plans, according to published reports. The completion of the agreement would advance China's global quest for new stocks of energy. It could also undermine U.S. and European initiatives to halt Tehran's nuclear plans, muddling Beijing's relations with outside powers. Caijing, a respected financial magazine based in Beijing, reported on its Web site Thursday that a Chinese delegation comprised of officials from the National Development and Reform Commission -- a top economic policy body -- intends to visit Iran as early as next month to conclude an agreement. The deal would clear China Petrochemical Corp., also known as Sinopec, to develop Iran's Yadavaran oil field. Beijing and Tehran are attempting to swiftly conclude a deal in the next few weeks, ahead of the possible imposition of international sanctions against Iran, according to a report published in Friday's editions of the Wall Street Journal. The report relied upon unnamed Iranian government officials. Sanctions could entangle Chinese investments inside the country. Chinese officials declined to comment, and calls to Sinopec's offices went unanswered. In a written statement, the Iranian Embassy in Beijing asserted that the two nations have been working together on energy development, "following the rule of mutual benefits and respect in all bilateral cooperation." A deal would cement a memorandum of understanding signed by China and Iran in October 2004. The framework agreement pledges that Sinopec will develop the Yadavaran field in exchange for the purchase of 10 million tons of liquefied natural gas a year for the next quarter-century. Analysts in China said the deal should primarily be seen as part of Beijing's global reach for new energy stocks to fuel its relentless development -- a drive that has in recent years led Chinese companies to invest in Indonesia, Australia, Venezuela, Sudan and Kazakhstan. China is now locked into a high-stakes competition with Japan for access to potentially enormous oil fields in Russia. But the speed with which China and Iran are now moving to conclude their agreement and begin development appears to signal Beijing's intent to limit the United States-led drive for potential sanctions against Iran to curb what Washington describes as a rogue effort to develop nuclear weapons. As one of the five permanent members of the U.N. Security Council, China has the ability to veto a sanctions proposal within the international body, or at least threaten to do so to restrict the bite and breadth of such an initiative. "The timing is really interesting," said Shen Dingli, an international relations expert at Fudan University in Shanghai. "China and Iran appear to be collaborating not only for energy development but also to increase the stakes in case sanctions are imposed. This is a subtle message that even if sanctions are passed, you could have limited sanctions without touching upon oil. China is saying, 'This is my cheese. Don't touch.' "
China's voracious appetite for energy is increasingly guiding its foreign policy. China has used the threat of a Security Council veto to limit sanctions against Sudan, the African nation in which China's largest energy firm, China National Petroleum Corp., is the largest investor in a government-led oil consortium. China is the largest buyer of Sudan's oil, as well as the largest supplier of arms to its ruling regime. The Sudanese government has been accused of massacring villagers to clear land for further energy development and of committing genocide in its efforts to crush separatist rebels in the western region of Darfur. China's pursuit of a completed energy deal with Iran comes as Tehran has announced the resumption of its uranium enrichment program. Tehran says this work is merely aimed at generating energy, while the Bush administration asserts it is a precursor to the development of nuclear weapons and has been lobbying its allies to take a hard line while threatening sanctions. China has joined the international chorus in urging Tehran to halt its nuclear plans. But China's aggressive pursuit of an oil deal with Iran underscores how energy security has become a paramount concern for Beijing at a time of relentless industrial growth. Government forecasts show China's demands for imported crude oil swelling from about one-third of its total needs to about 60 percent by 2020. Analysts assume that the Iranian field could produce as much as 300,000 barrels of oil per day, making it one of the larger overseas operations for a Chinese company. Sinopec would hold a 51 percent stake in the Yadavaran project, according to the Caijing report, while India's Oil and Natural Gas Corp. would hold 29 percent. The rest of the venture would be divided among Iranian companies and perhaps other outside investors. ` The international community is also speaking with one voice to the radical regime in Tehran. Iran is a nation held hostage by a small clerical elite that is isolating and repressing its people, and denying them basic liberties and human rights. The Iranian regime sponsors terrorists and is actively working to expand its influence in the region. The Iranian regime has advocated the destruction of our ally, Israel. And the Iranian regime is defying the world with its ambitions for nuclear weapons. America will continue to rally the world to confront these threats, and Iran's aggressive behavior and pursuit of nuclear weapons is increasing its international isolation. When Iran's case was brought before the IAEA earlier this month, 27 nations voted against Iran, including Russia and China and India and Brazil and Sri Lanka and Egypt and Yemen. The only nations to support Iran were Syria, Cuba, and Venezuela. Now Iran's case will be taken up to the U.N. Security Council. The free world is sending the regime in Tehran a clear message: We're not going to allow Iran to have nuclear weapons. This is an analogy of the current situation of IRI and the people of Iran in regard to the International Community. Iranians are like passengers of an airplane whose pilot is the manic IRI, during the last 31 years the pilot has been taking the airplane toward diving into one of the skyscrapers in another country (i.e. U.S.), the country U.S. has been alarming the pilot not to enter the aerial border of the country otherwise they would shoot down the aircraft. Now wouldn�t be stupid and in fact in vain for the passenger on board, in instead of preventing the pilot from his stupid mission, to call the U.S. authority and ask them for mercy and not to bomb the airplane?! It is not the U.S. who sends the bombers to Iran it is the stupid IRI that asks for the bombers to come, if you want to keep the U.S. bombers away from Iran, begging U.S. to change its mind would not work and is not the way to do it, the right way is to prevent the maniac IRI from continuing his suicidal mission. The tumor should be taken out of the cancerous body to give the patient his health back, ointment wouldn�t work. To get rid of the dangerous threat against humanity, you have to get rid of the maniac IRI, that is the only right way. "we have to get our head out of the sand. They disagree fundamentally with our way of life and will carry on unless met with determination and, if necessary, force." Surprise, surprise...when is the west going to learn that dialogue with Iran is useless? Surprise, surprise...when is the West going to learn from its mistakes and realize that dialogue with Iran is useless? When is the West going to listen to Iran's real opposition?